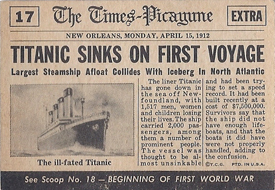 It's been a century since the Titanic sank. Yet its legend continues to grow. There has been no shortage of Titanic trading cards over the years that honor and document the nautical disaster. The first notable card came in 1954 Topps Scoop. From there, things were pretty quiet on the Titanic trading card front for more than three decades. That's when Leonardo DiCaprio became the self-proclaimed King of the World and the ship became the subject of one of the biggest movies of all-time. Inkworks released a small movie set while Dart Flipcards countered with a historical set. Since then, Titanic trading cards have shown up in a pair of sports sets, including cards with Titanic coal in 2009 Upper Deck Goodwin Champions. The movie's marquee appeared in 2011 Topps American Pie. Shortly after the 100th anniversary of the sinking of the Titanic, Cult Stuff will release a 27-card historical set of their own. Rare chase cards include pieces of Titanic wood, thread and fabric. Here's a breakdown of the various Titanic trading cards that have appeared over the years. These include major releases. Collectors may also find oddball releases distributed as premiums with food or other products. A historical look at the ship's tragic voyage, now defunct Canadian card maker Dart Flipcards produced a 72-card set amidst the mania of the James Cameron film. The set also included six die-cuts (1:18 packs) and two autographs. 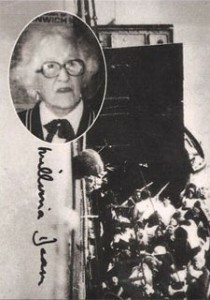 One of the signers was Millvina Dean, who was the last Titanic survivor before her passing in May, 2009. The other autograph features Ralph White, whose photos of the wreckage showed the world the ships watery tomb. An over-sized 3D card was available with a mail-away offer. Collectors could also buy a binder than came with four promo cards. Released at the peak of Titanic movie mania, this factory set was limited to 10,000 copies. Each came with a numbered certificate. The 25-card set factory set focuses on the James Cameron film, not the actual history. Cards have a full-bleed photo on the front and a short synopsis on the back. 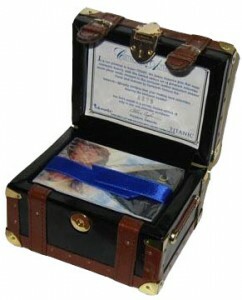 Perhaps the most interesting aspect of the 1998 Inkworks Titanic set is that it was distributed in a leather steamer trunk, giving it a high-end feel. In recent years, these factory sets have been often offered at blowout prices. Once a $60 set, they can be found for less than half that today. Collectors should also consider the added shipping cost with the over-the-top packaging. In May, micro manufacturer Cult Stuff will release the limited edition Titanic Commemorative Card set. Consisting of 27-cards, it's a history lesson in all things Titanic. Collectors can find cards with pieces of wood from the ship, coal, fabric and threads. 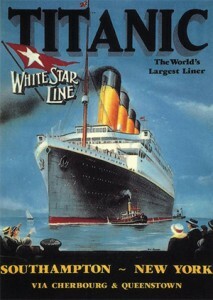 The Titanic has been included as a part of other sets over the years. Here are some highlights. One of the classic vintage trading card sets, 1954 Topps Scoop documented many of history's biggest events. Card fronts have sensational paintings, while backs are done like an old-time newspaper. Looking to capture the popularity of pop culture-themed mini cards like those found in Allen & Ginter Baseball, 2008 Topps Mayo Football produced a set of Famous Ships cards. The minimalist black-bordered card of the Titanic features a similarly colorless photo. 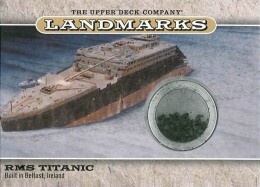 Inserted as a relic in the multi-sport/pop culture set, the 2009 Upper Deck Goodwin Champions Landmarks Titanic card was the first trading card to include something from the ship. Each card includes embedded pieces of Titanic coal. 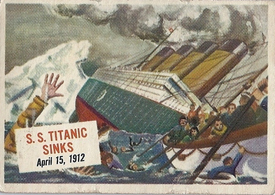 Although 2011 Topps American Pie looks at post-WWII pop culture, they still managed to work the RMS Titanic into the checklist. Sort of. 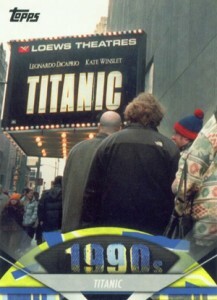 A card in the set commemorates the 1997 film with a picture of a movie theater marquee. Collectors can also look for Foil parallels and Spotlight parallels, which are numbered to 76. Hi: I have been trying for years to put together a master set of the Dart Flipcards Titanic set. If possible can you provide it or, at least how many promos there are and what cities they were released in. Thank you.